One of the dirty little secrets of the consumer Wi-Fi industry is that most devices can't take full advantage of the three and four stream designs of AC1750 and higher class routers. Most tablets and smart phones are single or dual-stream at most and will never reach those routers' highest link rates. For many people, two stream AC1200 class routers work just fine. They are cheaper and better matched to the devices they connect. So it's logical that Linksys made the second router in its WRT line an AC1200 class model, the WRT1200AC I'm reviewing today. Not so logical is its $180 price, when you can pick up a refurbished WRT1900AC for $175 and a new one for slightly more than the WRT1200AC. But I come to review the WRT1200AC, not to bury it, so let's have at it. Like the WRT1900AC, the WRT1200AC is designed to stack with other members of its family, including the SE4008 8 Port Gigabit Switch and WRTHDD2 WRT Network Storage Enclosure announced at CES 2015 and shipping in the next month or so. You'll note the top of the router has bumps vs. recesses; this is meant to keep other components from being stacked on it and blocking airflow. But the photo below shows the bumps don't prevent stacking, they just don't let the top component stack securely. You'd easily mistake the 1200AC for the 1900AC, except for antenna count. The 1200AC has the same indicators, which can be shut off (except for power). The rear panel is exactly the same, too, including the eSATAp port, which is a combination eSATA / USB 2.0 port. As noted in the 1900AC review, I would rather have wireless on/off switch than power and have the WPS switch on the front where it's easier to reach. There are slots on the four feet, so that it can be wall or ceiling mounted. Linksys again includes a documentation CD with the router that contains the obligatory legal notice and a rather brief PDF User Manual, which is not yet available for download from the product support page. Until Linksys posts the manual, you can download it here. For setup, all you need to do is plug in your modem cable, power it up and try to hit the internet with a browser. You'll get redirected to the Smart Wi-Fi setup wizard that will get you up and running in no time. Linksys requested short term confidentiality for all the documents they could, so I opened the 1200AC for a look after testing was done. It's quite a different animal than the WRT1900AC. The first photo is the assembly with outer covers removed. Gone is the huge honkin' heatsink and fan, replaced by a smaller heatsink covering the switch, CPU, RAM and flash areas. I suspect the Marvell Armada 38X dual-core SoC (88F6820-A0 C133) that powers the 1200AC runs cooler than the Marvell MV78230 Armada XP in the 1900AC. The second photo shows the board with heatsinks and RF shields removed. Both radios are the same Marvell 88W8864 4x4 Avastar used in the 1900AC, but integrated directly into the board this time. Most AC1200 routers use 802.11b/g/n radios on the 2.4 GHz band to save cost. The WRT1200AC uses the same design technique used in AC1900 and higher class products, i.e. using the same 11a/b/g/n/ac radio used in the 5 GHz side. This means 256-QAM link rates are supported on the 2.4 GHz band, in the highly unlikely event that you connect a device that also supports those rates. 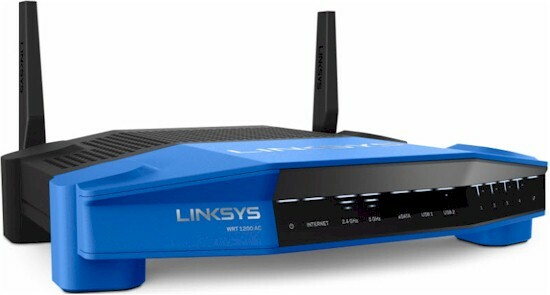 Thankfully, Linksys decided not to market the router as an AC1300 class product. That class briefly existed as the combination of a standard 2.4 GHz 3x3 11bgn radio and 5 GHz 2x2 ac radio. Table 1 has a summary of the WRT1200AC's key components alongside the WRT1900AC's. Note the change in 5 GHz radio components. There are both LNAs for receive and power amps for transmit. The 1900AC has only 5 GHz power amps.